According to reports, a man with a history of incidents with celebrities was arrested on Wednesday night after jumping a barricade and proceeding to attack Brad Pitt. “Los Angeles police said Vitalii Sediuk jumped a barricade around 7:30 p.m. at the El Capitan Theatre and battered Pitt, who was attending the premiere of “Maleficent,” which stars his longtime partner, Angelina Jolie,” the Los Angeles Times reported. 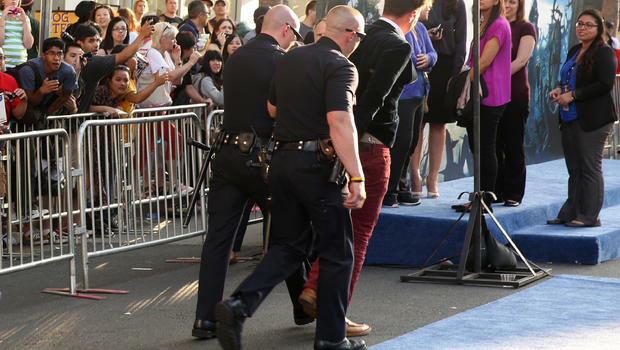 Sediuk was booked on suspicion of misdemeanor battery and was being held at the LAPD Hollywood Station. With a long history of harassing celebrities at a variety of events, he definitely has a solid case against him. To be a battery, there must be an unwanted physical contact with a person’s body, clothing or something they are holding or making contact with. While a person typically commits a battery by punching or kicking another person, a battery can also be committed by with an object, including an object is not usually considered a weapon, such as a lamp. Given the amount of witnesses and photo/video evidence, this will hopefully be Sediuk’s last outburst.